Looking to play some paintball? The German and American teams face off in an epic battle based off of the D-Day Landing on the beaches of Normandy. Come check out the custom missions and fight to secure your team's victory. We've hidden some eggs, they're waiting for you. Grab your Easter basket and come find a few. Low Impact version of the Easter Egg Hunt is available from 1-5pm. Cost is $39.00 per player and includes: gun, mask, air and 500 Paintballs. Kid friendly pick-up games (age 8 years and older) are now held every month. The next available date is May 5, 2019 from 1:30-5. Reservations are not required but they are recommended. The cost is $39.00 and includes gun, mask, unlimited air fills and 500 paintballs. NOW BOOKING LOW IMPACT KIDS GROUPS! Hogback is happy to offer low impact groups for younger children, aged 8 and older. 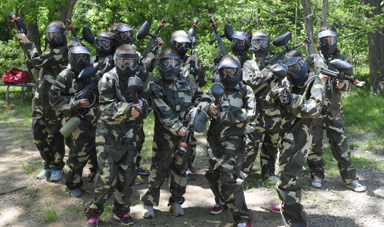 The groups are very affordable at $35.00 per person, which includes a paintball gun, a mask, unlimited air refills, and 300 paintballs for two hours of play with a referee and private fields. Call us now to book your low impact group, or click below to schedule easily online. In the event of inclement weather, please check any of our social media for information regarding any events, or call the field at (703) 777-0057. Looking for a party venue? 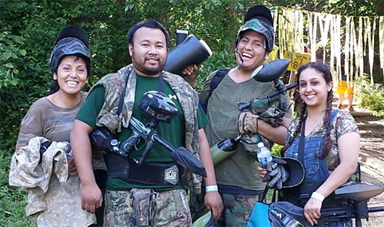 Hogback Mountain Paintball's mission is to provide a thrilling paintball experience in a fun and safe environment. Our beautiful location is the perfect site for group events such as corporate outings, birthday parties and get-togethers of any kind. Players of any skill level, ages 10 and up are welcome at our walk-on events every Saturday and Sunday. Ready to schedule a party? Private groups of any kind can be scheduled online or over the phone. If you want to pay the whole amount up front, go ahead and try our new online reservation system! If you prefer to speak to someone, you can call us at (703) 777-0057, or email us if you have any questions! What do I need to play paintball? 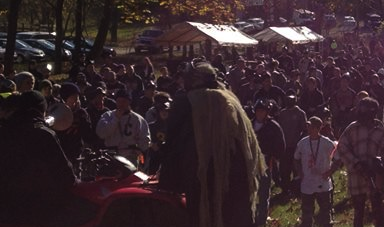 There are a lot of things you can bring or do before you come out to Hogback that will make your paintball outing as fun as possible. From what to wear, to what to bring (or not bring), we have everything you need to know in an easy-to-access format. We even have safety-briefing videos available!